"Aw, you little woocap, I'm glad you have a noggin!" Why add two letters and a syllable to a perfectly acceptable three-letter, one-syllable word? That actually wasn't my choice, really. When I was an infant, my parents started calling me by my initials, and it just stuck. I can't remember a time when I've not been referred to by initials rather than name. Not that unusual. I know someone who is often called "L.V.". My cats have human names: Chloe, Hailey and Sasha. I call them "the monsters" sometimes which is sarcasm as all three of them are extremely sweet and loving. I also had a cat named Sasha. My Sasha is an almost 9 month old chocolate point Siamese kitten. She's absolutely bonkers She constantly chases the much bigger Hailey around the house pouncing on her. Sasha was really sick and malnourished when I adopted her and being close to death has caused her to be fearless. She sometimes pisses Chloe off because she likes to play and Chloe doesn't. We've had a Sasha and a Chloe over the years. Don’t know if anyone saw yesterday’s new Capital One ads with Samuel L. Jackson, Charles Barkley, and Spike Lee. In one of them, Barkley has a parrot he’s named Larry—Larry Bird. Naturally, the basketball player of that name then walks in with his dog—Charles Barkley. Here are my monsters. 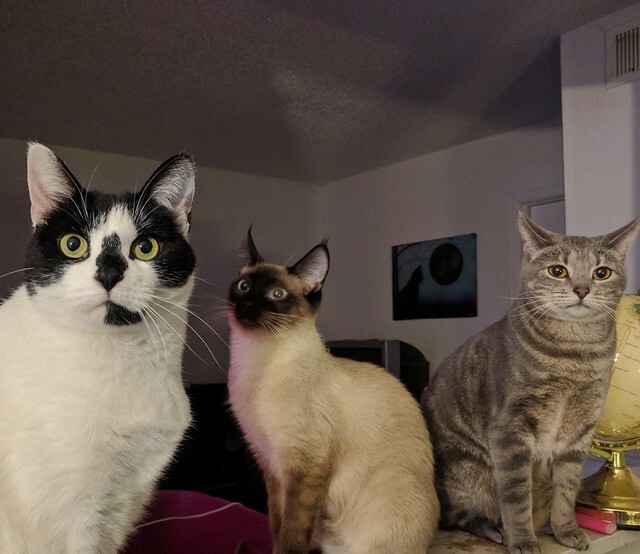 Chloe is the black and white bicolor cat, Sasha is the chocolate point Siamese and Hailey is the gray tabby. I took this picture a few hours ago. My brother calls his daughters' dogs (named Jace & Kovich) nerds. He would say, "Esther (or Katherine), time to put out/let in/walk your nerd." Ah yes, the importance of the ' apostrophe (for the possessive in this case). I've since corrected my earlier post. I think the first time I ever heard anyone call someone a "nerd", it was about a dog. Someone was talking about a dog and they said, "That nerd!" Also, the first time I ever heard someone call someone a "geek" was in 5th grade, when we visited the 6th grade class at the middle school. Some kid called someone a "geek", and the home ec teacher lectured them that a "geek" was someone in a circus who bit heads off animals. Scum-sucking pea-head with a lousy physique. That's what Roger Ebert says, too. Also, a freakshow, not a circus.